We found that our kids confused salvation with sanctification when they answered that question. I know that they are not the only ones. In fact, many adult Christians do the same thing. Here is the first of a few posts where I’ll describe some activities we did with our kids to help them to understand the Biblical answer to that question and how to differentiate salvation from sanctification. It’s the latest installment of my Theology for Kids series. Did you notice how all of these answers have more to do with sanctification that with salvation? Salvation is the act of accepting the free gift of Jesus to pay the penalty for our sin. Jesus was our substitute. He took on the consequence for sin (which was death) in our place. Salvation is also committing to live our lives in accordance with what God asks us to do and be. Salvation happens once. Sanctification is the daily and lifelong process of becoming more like Jesus. It demonstrates that we are acting on our commitment (made during salvation) to live according to God’s standards. We won’t do this perfectly. Sanctification involves asking for God’s help to live the way He wants us to and asking forgiveness each time we sin to restore our relationship with God. Sanctification happens over and over. When our kids were very little, we often explained how a person became a Christian. But we found that they couldn’t retain the details. Even at 5 and 7 years old, we still got unsatisfactory answers like those above. But it’s not just young kids who are making this mistake. More recently, I’ve witnessed professing adult Christians fumble to explain salvation or to answer the question that I posed at the beginning of this post. I’ve watched YouTube interviews of teenagers who claim to be serious about their faith, but can’t explain the gospel or salvation. It’s understandable. For one, as far as I know, Christianity is the ONLY religion that does not have a works-based approach to salvation. Our culture is so used to the idea of appeasing God or doing something to make Him happy. Second, the Bible does talk a lot about ‘what we are to do’ and ‘how we are to be’ as Christians. But many people mistakenly believe that we need to do certain things in order to become a Christian. Its an area that’s ripe for confusion. 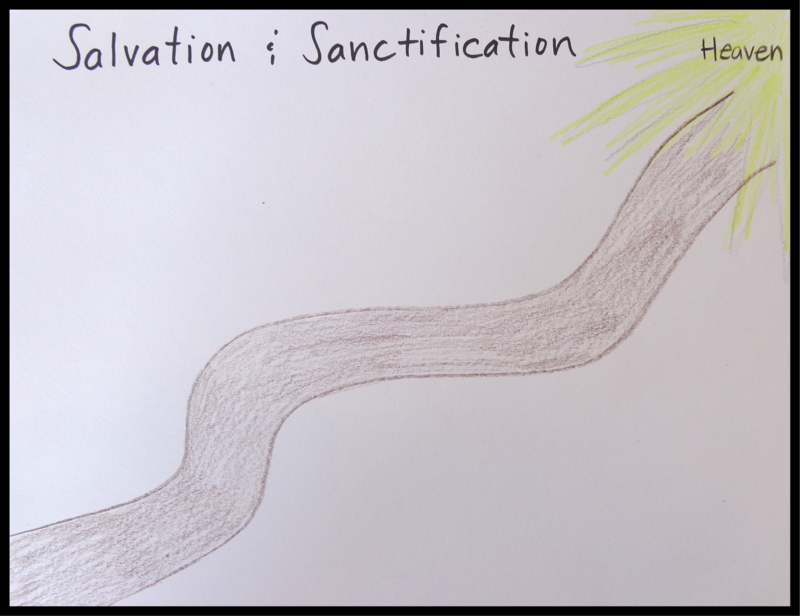 So, two summers ago, I spent some time differentiating salvation and sanctification with our kids. I am happy to say that they finally get it. To be sure, these will only cover the basics of salvation and sanctification. I’ll be posting on these activities over the next few weeks. I hope they are helpful to you and your family. Do you have any ideas on helping children understand salvation vs. sanctification? Tell me about them! ← Theology for Kids: What is God Like?